There is a crispness in the air, which means fall is right around the corner. As you drive around town you will see the kiddos are back in school and the college students have returned to campus. I love fall in Laramie. The temperature is much more reasonable, the holidays are just around the corner and fall sports begin again. There is a basket near the front of the shop with index cards. Please take a few minutes to let us know how we are doing and what you would like to see in the shop during the next year. Are you looking for something to do in October? Do you have unfinished quilts? Do you want to spend time with other quilters? How about a weekend of having every meal prepared for you? If you answered yes to any of these questions you need to sign up for the fall Unfinished Objects Retreat. The retreat is scheduled for October 20-23. The registration fee is $275, which covers lodging and meals. 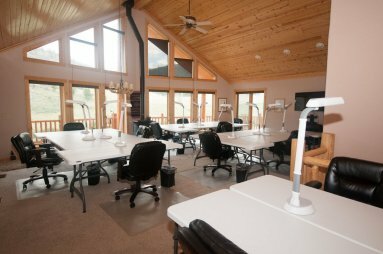 The retreat house is in a fantastic location near Red Feather Lakes. The scenery is beautiful and the food is delicious. You don’t have to do a thing all weekend but relax and quilt. There is still space available so sign up soon. The American Sewing Guild is having a Sew Fest weekend on September 24 at the Historic Train Depot. As part of this event, Blakeman Vacuum and Sewing will be servicing sewing machines. There is a signup sheet available in the shop. If you are interested in this service please sign up or contact Irene Devin at 307-742-3901 (home) or 307-760-3510 (cell). Row by Row will be coming to an end on September 6th. We sold out of our license plates, but still have kits and patterns available. We haven’t had a winner yet, but hope to see one soon. Don’t forget that if you finish a quilt using 8 rows and are the first one to bring your finished quilt into the shop you can win a prize. The first home UW football game will be Saturday, September 3rd. We will have an Open Sew that day and I’ll keep the shop open for a late-night sew. Sign up soon so we can make plans. We’ll order in dinner, sew and listen to the game. Speaking of UW football . . . the new Steamboat fabric is here. Steamboat is smaller and the fabric also showcases a W. This is the only time this fabric will be available, get yours while supplies last. The Tonga Gemstones Club will meet on September 8th at 5:30. Second Saturday Sampler will meet on September 10th. We are working on the third year in the book 501 Rotary Cut Blocks. We are completing 12” blocks this year. Join us at the shop if you can at 10:30 to see what block we’ll do next. Don’t forget about the “A” Team. They meet on September 27th at 2:00. 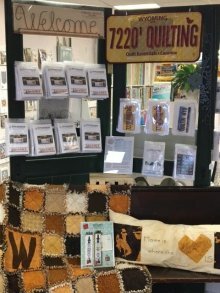 The Wyoming State Quilt Guild Opportunity quilt will be on display in the shop from September 12-25. Please stop in to see this fantastic quilt and purchase a raffle ticket for your chance to win it. To finish off the month, I will again be traveling to Quilt-A-Fair on September 23-24. This always a fun show and if you have time I hope you will join me. Make sure to check out the Quilt Essentials calendar or follow us onFacebook for more information.